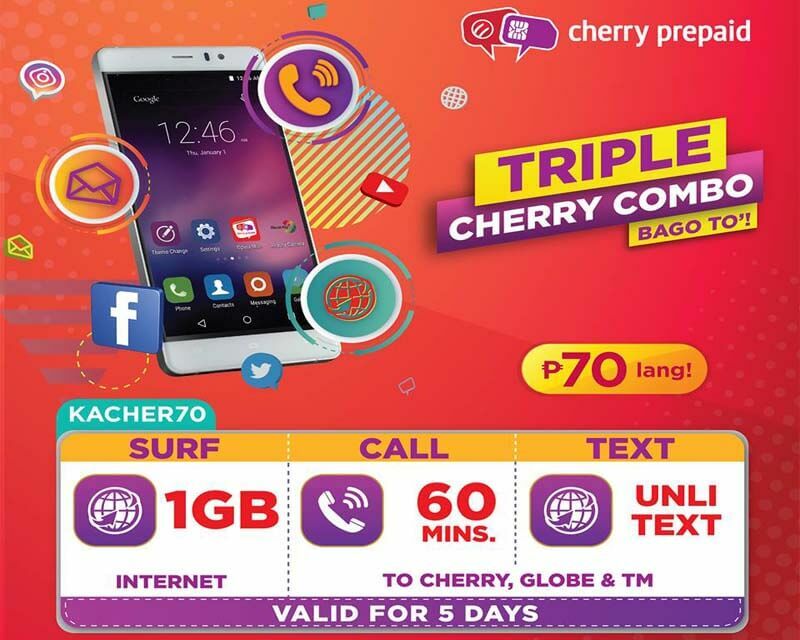 You can do more with the latest Cherry Mobile’s prepaid promo KaCher 70 offer. It gives you 1GB internet and unlimited text to Globe, TM, and Cherry SIM users for only 70 pesos. You also get limited calls up to 60 minutes consumable up to 5 days. This package has all the services you need for surfing to calling plus the text within Globe powered network subscribers. 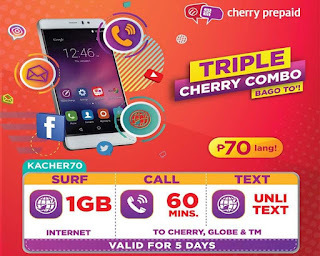 The Cherry Prepaid KaCher70 promo is catching up with Globe’s GOTSCOMBODD70 with 7 days validity, Smart’s GIGA70 and Sun Cellular’s Big Time Data 70 in terms of all in one bundled network services. The downside of Cherry Prepaid’s offer is the validity period that is only up to 5 days and the unlitext that only covers Globe network powered users. You can subscribe to this offer by simply texting the keyword to 2138. All you need to do is reload your Cherry SIM with the amount of 70 pesos at your nearest load retailer and you are ready to avail this new tri-net and combo offer. To register, just text KACHER70 and send to 2138. Wait for the SMS confirmation from Cherry Prepaid before you start using the promo to avoid the unwanted load deduction. To call, you can simply dial any Globe/TM/Cherry mobile number of the person you are trying to contact. To know your remaining balance of this promo, just follow how to Balance Inquiry to get the details. Check out Cherry Prepaid Call, Text & Interner Offers for the list of updated promos.